If you know me (and this blog) you know I love racks and b**bies (incl mine). Our breasts serve an evolutionary function as storage for all the goods things that need to be passed to the next generation, besides adipose storage and breastfeeding. Omega-3 fatty acids from seafood, grassfed game, herds, and free range poultry are selectively stored in breast, gluteal, abdominal and thigh fat. And the amount that gets stored in the breasts and other fatty tissues is governed in a dose-dependent fashion over time. The nutrients in the breast are important not only for lactation (year 1-2 for newborns) but also for gestation. Our breasts become factories to feed the next generation all the things that nourish and grow the massive homo sapien brain and forward-gazing, stereoscopic, color vision, X-ray eyeballs, which doubles in physical size during the first 12 months of life. The contents of breast milk are super foods for newborns: MCTs (caprylic acid, lauric acid), omega-3 fatty acids (EPA + DHA), taurine, vitamin A, vitamin D, magnesium, zinc, iodine, colostrum, amino acids, galactose, IgM, immunoglobulins, protective enzymes, epidermal growth factor, etc. For certain nutrients, naturally, maternal supplementation also works when the mom cannot breastfeed (hormone imbalances, anatomical issues, neonatal twisted tongue, etc). A baby is born with inherent 'leaky gut' (intestinal permeability) for the first few months in order for some of the larger protein molecules and mom's immunity to pass directly into their blood stream for immunoprotection. Since the baby has an underdeveloped and immature immune system, there is no point in vaccinations (full of toxic aluminum or mercury) on Day 1 of life (assinine). Many factors in breastmilk subsequently raise of the IQ of newborns who breastfeed. In one study, the breastmilk (not necessary connected with the close maternal-baby contact, milk in tube) was associated with a 8.3 point increase in IQ testing in preterm children at age 7.5-8 years of age compared with no breastmilk. "Its unique recipe of fatty acids boosts brain growth and results in babies with higher I.Q. 's than their formula-slurping counterparts. Nursing babies suffer from fewer infections, hospitalizations and cases of sudden infant death syndrome. For the mother, too, breast-feeding and its delicate plumbing of hormones afford protection against breast and ovarian cancers and stress. Despite exhaustion, the in-laws and dirty laundry, every time we nurse our babies, the love hormone oxytocin courses out of our pituitaries like a warm bath. Human milk is like ice cream, Valium and Ecstasy all wrapped up in two pretty packages." 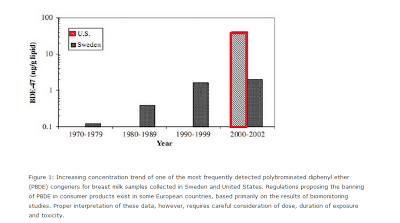 Source: NYT Toxic Breast Milk? Credit: NYT Toxic Breast Milk? Unfortunately our breasts store both the good and the bad... our fatty breast tissues are magnets and reservoirs for fat-soluble toxins and heavy metals from our produce (pesticides), commercial meat (growth hormones, pesticides), marine fish and seafood, pharmaceuticals (aluminum antacids, mercury/Al from vaccines, etc), dental (mercury and other metals from amalgam and titanium dental implants), Teflon cookware and coated clothing (PFOA), and environment (flame retardants, mercury/arsenic from coal burning plants which supply 40-50% of USA energy, aluminum from municipal water, blah blah blah). The individuals who are least likely to have the biochemical mechanisms to chaperone and eliminate these modern industrial toxins, are the individuals most highly likely to develop inflammatory conditions including cancer, autoimmune diseases and Western chronic diseases. Some of the identified genetic variants are MTHFR (Amy Myers MD), GSTM1 (Mark Hyman MD), COMT, ApoE4, CBS, GSTT, BRCA1/2, and several other emerging ones. A functional medicine doctor and dietician, Dr. Elizabeth Boham MD talks about how she developed breast cancer in her 30's despite 'doing all the right things' eating low fat, exercising regularly, etc HERE. She talks about how to identify and remove toxins in our food, lifestyles and environment. A functional medicine and SNP case study: 'George'. To see more on SNPs and diverse associated human diseases, go into OMIN (online Mendelian inheritance in man), RegulomeDB.org/GWAS and PrometheASE. Who has pesticides and PCBs in their toxome? Apparently everyone -- adults and newborns before even their first breath of air according to CDC, NHANES and EWG studies. Even the President's Panel reported so in 2008. From Dr. Pizzorno in Is Toxin Exposure Relevant? We must do much. The statistics for lifetime sporadic cancer risk is currently 1:3 and will exponentially increase to 1:2 by 2020 according to WHO statistics. I believe it. Our toxome is excessive and unfortunately no diet (even paleo or ancestral diets) frees us from the pollution and the body burden accumulated over generations (our mothers, their grandmothers and, particularly, this current one). We can thank the World Wars which ushered in technology (nitrogen fertilizers, Agent Orange). It is rather wicked and ironic that the best green for liver support and thus elimination of pesticides, metals and PCBs is dandelion greens (e.g. a weed) introduced to the Americas by the British. Good luck as we shall all need it. Credit: Regul Toxicol Pharmacol. 2006 Apr;44(3):249-61.